Somewhere on the great arch of time that stretches back to Elizabethan England, Will Shakespeare became a scary character. At some point, this matchless magician who delighted audiences in his own day by pulling wondrous phrases out of his hat, this amazing wit who could fill the mouths of princes and ragamuffins with the most hilarious insults, became daunting. 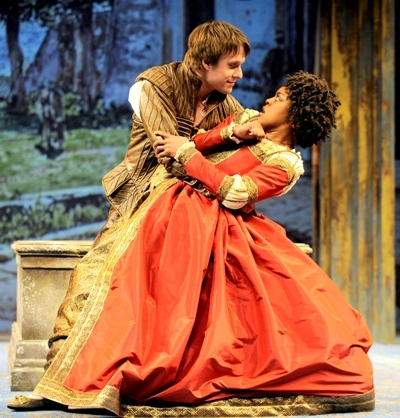 Which brings me to what I love so much about Chicago Shakespeare Theater’s foreshortened, distilled, mad and merry romp through “The Taming of the Shrew.” It’s a production created for young audiences and played by a youthful cast bubbling over with energy and understanding and charm. But what really kept the smile plastered on my face was the laughter in the house, the quick uptake by a predominantly teen audience that had no trouble at all connecting with this spunky side of the Bard of Avon. “Shrew” is a crazy, fun-filled play that’s tailor-made for youngsters on the verge of adulthood – that is, lads and lasses of any generation who are roughly the age of fair, gentle, eminently marriageable Bianca and her spitfire of an older sister, Katharina, a.k.a. Kate and even Kate the Curs’d. Therein lies the hang of it all: Baptista, a fine old gentleman of Padua, will not allow Bianca to wed any of her numerous suitors until somebody comes along to take hissing, scratching Kate off his hands. 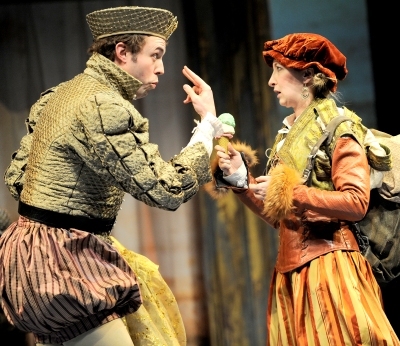 Enter Petruchio, a stranger just arrived in Padua to find a suitable wife, meaning a wealthy one. One whiff of Baptista’s promised dowry and Petruchio declares himself Kate’s man, and he quickly proves her equal in wit and combat alike. So at it they go, tooth and nail – while Bianca’s competing suitors try to outfox each other for her favors. Among them is a rich young newcomer called Lucentio, who switches clothes with his servant in a bold scheme to get close to Bianca. The situation screams comedy. 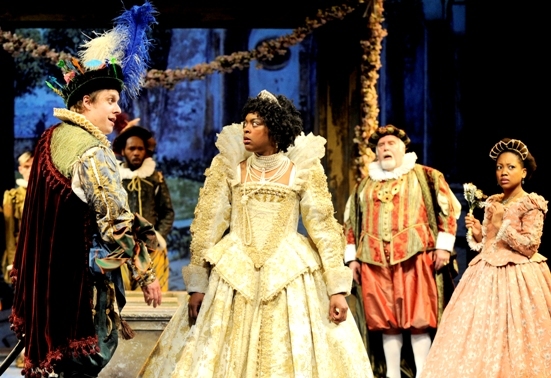 And Chicago Shakespeare’s young players milk it for every ounce of mistaken identities, duplicity, double-entendres, slapstick physicality and over-the-top turmoil. Director Rachel Rockwell’s artful trims in the text have reduced the play’s length to a succinct but neatly rounded 75 minutes of unbroken hilarity. I’ve seen many a full-length “Shrew” and I’m sure I never laughed so hard at any of them. Ericka Ratcliff is a fearsome Kate, a hellcat whose idea of a good defense is a first-strike offense. It takes quite a guy to subdue such a shrew, and Matt Mueller’s Petruchio proves just as willful as Kate, just as rugged and a good deal calmer. They also both manage Shakespeare’s stylized language with clarity and nuance. Of the encircling troupe, Tiffany Yvonne Cox is a wily Bianca, shrieking at Kate’s abuse one moment, then secretly laughing about the sympathy she draws from her doting father. As Lucentio and his servant Tranio, Nicholas Harazin and Alex Goodrich bring off the identity reversal with high spirits and tons of laughs. 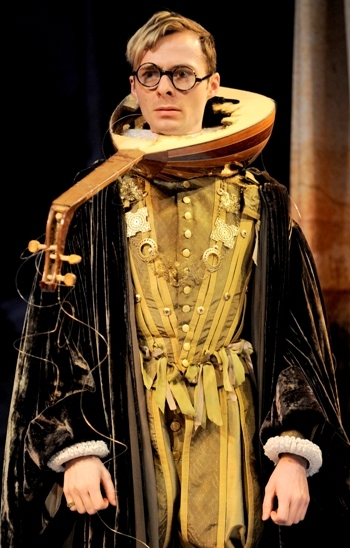 But the show’s real laugh machine is Matthew Sherbach’s Hortensio. The unlikeliest of suitors, fragile and fearful, he’s also the most inventive of comedians. Jacqueline Firkins’ colorful costumes provide all the accent needed for set designer Kevin Depinet’s minimalist town square. What is so good that it almost escapes notice is the company’s mastery of Will Shakespeare’s language. There’s no thought of daunting poetry here, just the lusty brilliance of a writer who 400 years ago looked about him at the eternal verity of youth, and got it. 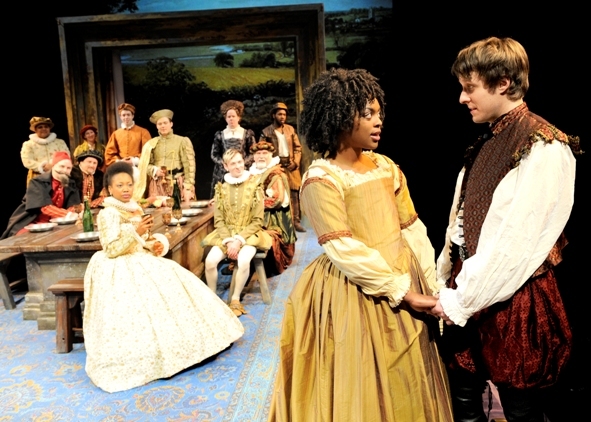 The full story of “The Taming of the Shrew”: Read it here.